While the σ-bonding in graphene is assumed to be a rigid honeycomb framework built out of two-center two-electron (2c-2e) C-C σ-bonds, the π-bonding is supposed to be delocalized. However, according to the adaptive natural density partitioning (AdNDP) analysis and the electron sharing indices, graphene is aromatic, but its aromaticity is different from the aromaticity in benzene, coronene, or circumcoronene. 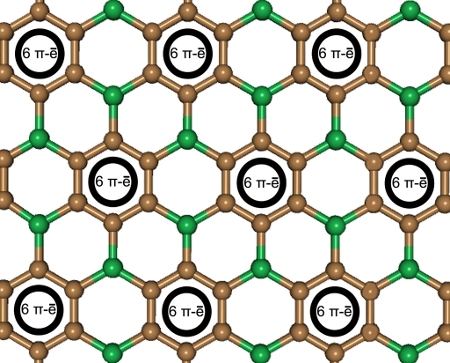 Aromaticity in graphene is local with two π-electrons located over every hexagon ring. 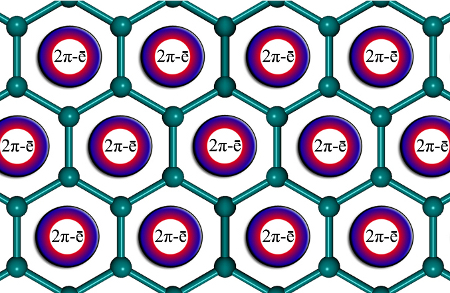 The chemical bonding picture developed for graphene is supposed to be helpful for understanding chemical bonding in defects such as point defects, single-, double-, and multiple vacancies, carbon adatoms, foreign adatoms, substitutional impurities, and new materials that are derivatives of graphene. According to the chemical bonding analysis of the BC3 honeycomb epitaxial sheet, which could be considered as a graphene derivative, the substitution of every fourth carbon atom in graphene by a boron atom preserves the honeycomb structure in the BC3 two-dimensional lattice, but as we found by the AdNDP analysis, it remarkably alters the chemical bonding. First, in the BC3 lattice, where boron atoms are surrounded by three carbon atoms, carbon forces boron to form 2c-2e B-C σ-bonds, while boron is known to participate only in multicenter (3c-2e or 4c-2e) σ-bonding in the most stable two-dimensional form of the pure boron lattice, the alpha-sheet. 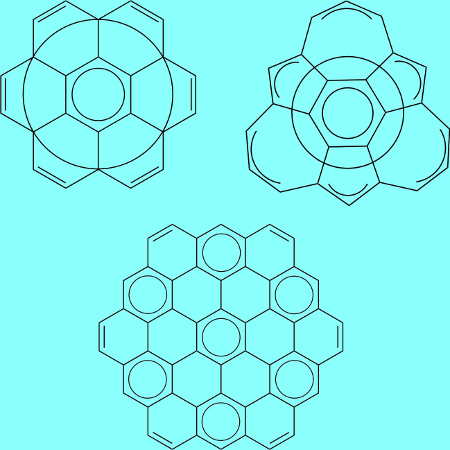 Second, 6c-2e π-bonds found over every hexagon in graphene and in the alpha-sheet migrate in BC3 to hexagons composed out of carbon atoms only(6 π-electrons per carbon hexagon), making π-bonding in those hexagons more similar to the corresponding π-bonding in benzene rather than graphene, leaving hexagons formed by carbon and boron atoms in the BC3 lattice without π-bonding. We believe that the chemical bonding pictures found for graphene and the BC3 lattice will be a useful tool for rationalizing chemical bonding in other two-dimensional boron-carbon materials. On the basis of the AdNDP analysis results as well as on the results from the current-density maps, multicenter indices (MCI), and nucleus independent chemical shift indices (NICS), we proposed chemical formulas for the mostly known PAH: coronene, isocoronene, and circumcoronene. Our formulas for coronene and isocoronene show two concentric π-systems while circumcoronene does not have globally delocalized π-systems. Instead, we have seven locally aromatic systems and the overall chemical bonding pattern of circumcoronene is consistent with the Clar structure of this molecule, while coronene and isocoronene cannot be represented by a single Clar structure. The chemical bonding analysis using the adaptive natural density partitioning method of the C4F fluorinated graphene sheet revealed a chemical bonding model explaining its particular stability. We proposed that the stability of the C4F fluorinated graphene is due to the so-called "benzation" of graphene. On the basis of our chemical bonding model we predicted that other high-symmetry structures of the C7F4, C3F3, C13F10, etc. stoichiometries, containing planar hexagons, which are separated from each other by 2, 3, 4, etc. C-F fragments could also possess additional stability. We also suggested that other functionalized graphene structures of the C4X and C7X4, C3X2, C13X10 stoichiometries, where X is a monovalent atom (H, F, Cl) or a monovalent group (CN, CCH etc. ), could also have extra stability. We hope that the developed model, obtained for the functionalization of pristine graphene, will give an impetus for experimentalists to devise methods, which could serve as useful tools for producing this kind of materials with the tailored properties. "Benzation" of graphene upon addition of monovalent chemical species Ivan A. Popov , Yafei Li , Zhongfang Chen, Alexander Boldyrev Phys. Chem. Chem. Phys., 2013, 15 (18), 6842 - 6848.